With the support of a multitude of organizations, New York City hopes to create a wholesale facility to benefit farmers and low-income consumers—and everyone in between. 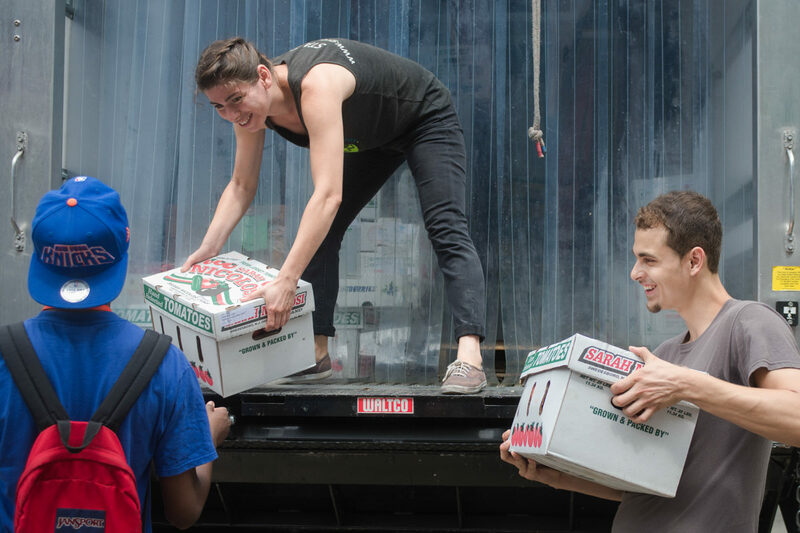 Picture thousands of pounds of local, seasonal produce traveling by truck to a centralized location in New York City every day. Once there, the fruits and vegetables from upstate farms will get refrigerated, packed, and processed before being distributed to stores and institutions all across the five boroughs. This is the vision behind the highly anticipated food hub that New York State governor Andrew Cuomo announced he was allocating $15 million toward building last month. The state-of-the-art hub is planned for the Hunts Point section of the South Bronx, an area with a complex history of aggregating the city’s food. The governor’s news was met with cautious optimism among a wide-ranging group of organizations that considers the hub the best means of ending a distribution bottleneck between rural upstate farmers and urban downstate consumers. It’s hoped that the vast 120,000 square foot indoor/outdoor market, which may break ground as soon as Fall 2017, will create some 245 jobs, increase New York farmers’ access to wholesale customers, and make fresh produce more affordable in vulnerable communities. In fact, the green-lighting of the hub was announced in conjunction with the release of a New York State-New York City food hubs task force report that voiced support for projects such as these. It’s also in line with research conducted by the U.S. Department of Agriculture (USDA) that shows that hubs provide strong benefits to low-income neighborhoods in need of fresh, affordable food, and small- and mid-sized farms looking to expand their income by reaching large-scale outlets such as supermarkets, school districts, and hospitals. James Barham, a food systems specialist with the USDA, helped put together the department’s Regional Food Hub Resource Guide back in 2012. He thinks Greenmarket Co.’s model follows the recommended criteria for success: strong partnerships, stage development—Greenmarket Co. has been operating a smaller hub out of a 5,000-foot rented storage unit for the last two-and-a-half years—and a wide range of experience with the complexities of New York’s food landscape. Hunts Point is already the site of an enormous wholesale food distribution center, which supplies 22 million New Yorkers with produce every day. But it has effectively shut out regional growers in what Barham calls a “turf battle” meant to stifle competition. Still, by building the new hub there, Greenmarket Co. can take advantage of a neighborhood that’s already zoned for warehouses and food distribution, thereby avoiding a lot of regulatory red tape, according to Hurwitz. The Bronx location has other advantages, says Margaret Brown, an attorney with the National Resources Defense Council (NRDC), an environmental non-profit that supports the hub. Bodegas and supermarkets that serve “food desert” areas “already go to Hunts Point to buy, so it will be easier to get local produce into that channel,” she says. He thinks part of that effort needs to include nuts-and-bolts solutions to fix inefficiencies in the distribution system—a farmer currently making the brunt of his money by supplying farmers’ markets has to maintain and drive his own truck for early morning runs, and contend with the challenges of weather and fuel prices, for example. Rosenberg also points to the importance of “connect[ing] the dots” in the public’s mind about where the local food they’re clamoring for actually comes from, and how it reaches them. Great piece Lela, have you connected with The Good Acre MN? They're in our local area and seem like a similar idea. What overlaps do you see? On a related note if you're ever in the Minneapolis area you should stop by FOOD BUILDING for a tour. We'd love to show you the good food momentum around here. I had no idea this was in the works. This is very encouraging. I also see opportunities for hubs in each NY county that aggregates farm products locally for the trip to the NYC Hub.